"Elijah Wald's book, a collection of vignettes and interviews with some of World Music's greatest stars, is an absolute page-turner." "Perhaps the most significant contribution of Global Minstrels is the way it helps to rehumanize the discussion of world music by allowing the voices of the artists themselves...to be heard above the din of academic debate." "Former Boston Globe world music critic Elijah Wald’s new book covers the key artists and performers from five continents, while also offering the complete novice a thorough introduction to international sounds and letting the musicians themselves explain what they’re doing through a series of interviews. Whether explaining the differences between Southern and Central African sounds, taking readers through the network of Latin American genres, examining Europe and Arabic styles or exploring in Hawaiian and Native American music its links to other cultures, Wald does an admirable and commendable job of explanation without oversimplification." A collection of conversations with some of the foremost musicians and singers on the "world music" scene, this book is an attempt to both provide a survey of that scene and explore the similarities and differences of musical experiences around the globe. In the last twenty years, the United States has seen an explosion of international recordings and concerts, fueled both by a growing interest among mainstream listeners and by the huge influx of new immigrants. 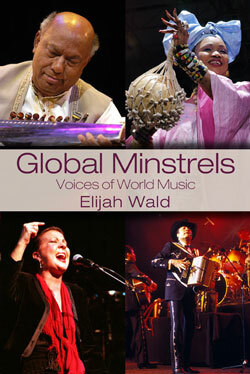 Global Minstrels includes interviews with many of the most popular international concert artists--Paco de Lucia, Ravi Shankar, King Sunny Ade--as well as performers who are little known outside their own communities, be they Caribbean, African, or Native American. Some are studious classicists, some good-time dance bands, and some deeply rooted folk artists. The book is divided into geographical regions, each introduced with a few paragraphs about its special characteristics and concerns, and some exploration of how it has been treated in the world music boom. The idea is to give a broad picture of the world music scene, largely from the perspective of the artists themselves. It shows the links between musicians in many different cultures, their shared concerns and challenges, and the differences and similarities in their lives. "Elijah Wald is a strong, knowledgeable writer with a real gift for synthesis and a diversity of experience that makes him capable of looking at the big picture." "I found this book a fascinating exploration. I have often wondered about this term 'world music' and frankly what it means and what its relevance is. This book helped me get closer to an answer while bringing so many artists from around the world to me-- who they are, where they come from and what their lives are like, politically, culturally and artistically, that makes them so powerful. This book will help all those interested to explore the artists, their homelands and their traditions." Note: The choice of artists was driven both by geographical considerations and by the quality of the conversations themselves. I tried to present a range of the most articulate performers I have spoken with during more than fifteen years writing about international music. Some of these decisions were admittedly quirky, as are some of the geographical designations--listing Ruben Blades under New York rather than Panama, for example, and putting one Turkish musician in the European section and another in the section for Western and Central Asia. Rather than attempting unsatisfactory explanations, I'll just say that the histories of populations and of the world music audience have been full of quirks, and I went with what seemed appropriate to me in each case, at the moment I was assembling the collection, without presuming to create a falsely coherent picture.